This is the second half of an article about water heater code. These codes specify where and how a water heater must be installed. Al’s also provides full service plumbing maintenance, repairs and replacements for every plumbing component in your home. Al’s sells and installs Rheem Professional Series gas & electric water heaters, and tankless water heaters. Al’s is near your home in Plano, Garland, and Richardson. We service all homes in southern Denton and Collin Counties with no additional travel charges. Al’s Plumbing Sells Rheem Professional Grade Water Heaters. They are identified by the word “Professional” on the label. If It doesn’t say Professional, It’s Not Professional Grade. Professional Grade cannot be bought a Big-Box discount retailers. Click Here to see the 2015 Texas Plumbing Codes: IBC Codes 2018 Chapter 5 – Water Heaters Note: The 2018 International Building Codes (IBC) may include updates to what is shown with the link. The high one will mostly provide air for the exhaust gases to vent out safely. The low one will mostly provide air for gas combustion-air while the water heater is heating. WHY? : Carbon Monoxide Danger. If sufficient combustion & exhaust air supply is not available, the exhaust won’t rise through the flue and out of the house. Double-Wall (Type B) Metal Vent Pipe For Exhaust. Water Heater Code requires the rise-length of the metal pipe may vary by municipality. It’s often 5 feet between vent hood (attached to top of water heater) and vent cap (on the roof, outside the home). Water Pipe Insulation: Water Heater Code requires the first 5 feet of hot and cold water pipes are required to be insulated if they are exposed in unconditioned space. Water Heater Code requires electric water heaters to conform to the requirements of this code and provisions of NFPA70. These appliances can be disconnected by a circuit breaker, with no additional means of disconnection required. WHY? : If Electricity Is Turned On During Water Heater Service, An Electrical Shock Or Electrocution Can Occur. Note: The lockout device will not interfere with the operation of the circuit breaker. 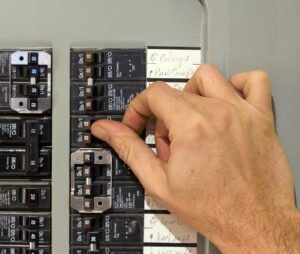 If the circuit breaker trips, the power is shut off regardless of whether the breaker’s handle is allowed to move. Note: A padlock is required, but code does not require the label as shown above. The label is to clarify why the padlock and locking-device are present. Water heater code requires a Temperature & Pressure (T&P) Relieve Valve. The T & P Valve will open at a predetermined pressure (150 PSI in most cases) and/or a predetermined temperature (210F in most cases). The valve allows pressurized hot water to escape from the tank until the pressure and/or temperature drops below the valve’s pre-set levels. Then the valve closes. 504.17 Water Heater Code requires the discharge piping serving a T & P valve shall be one nominal size larger than the size of the T&P valve outlet, where the relief valve discharge piping is installed. The outlet end of such tubing shall be fastened in place. WHY? : If The Pressure-Relief Valve Opens (due to high pressure inside the storage tank), It Can Send Scaling Water In All Directions From Near The Water Heater’s Top. The Connected Pipe Is To Ensure Scalding Water Discharges Safely At The Floor, with a drain nearby or discharges in to the pan the water heater sits within (the pan is connected to a drain line). It’s not uncommon that some DFW homes have a water heater(s) in their attic. 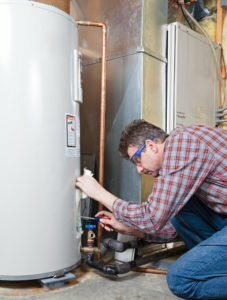 Since most water heaters start streaming water when their water storage tank cracks, the water released can cause scalding of anyone walking below the water heater once it’s leaking. Additionally, ceilings can become water damaged. 504.7 Water Heater Code requires a metal drain-pan under the water heater if it is installed in an area where water can cause damage. Shown: Metal Water Heater Drain Pan. Can be used for gas or electric — metal required for gas. Water Heater Code allows an ELECTRIC storage water heater can be placed in a plastic drain pan not less than 0.036 inch in thickness. A plastic pan shall NOT be installed beneath a gas-fired water heater. Water Heater Code requires a thermal expansion tank be installed where a storage water heater is supplied with cold water that passes through; a check valve, pressure-reducing valve or backflow-preventer, a thermal expansion tank shall be connected to the water heater’s cold water supply pipe in a location beyond these devices. Thermal expansion tanks shall be sized in accordance with the tank manufacturer’s instructions and shall be sized such that pressure in the water distribution system shall not exceed that required by Section 604.8. A standard water storage tank water heater can stress plumbing due to the normal thermal expansion of water when it’s heated. A thermal expansion tank can help minimize the risk of pressure damage to the entire plumbing system. It’s estimated that 50 gallons of cold water expands to 52 gallons when heated to 120°F. The water heater creates extra water-volume each time it heats the water. The extra water volume can create excess pressure in the plumbing system, possibly causing damage to the water heater and the water pipes. The water heater thermal expansion tank provides a place for excess water volume. When the water (inside the water heater) heats up, the additional water volume moves into the thermal expansion tank. 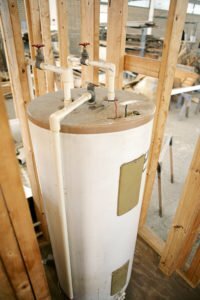 When the water (inside the water heater) cools, the water is moved from the thermal expansion tank back into the water heater’s storage tank. WHY? The thermal expansion tank eliminates the pressure (of expanded water volume) putting avoidable stress on the water heater and the water pipes connected to it. The elimination of the pressure reduces the chance of leaks in both the water heater and water pipes connected to it. Electrical Bonding Of Water Pipes: Water Heater Code requires bonding of the hot cold and gas water piping with 6 AWG wire and clamps will successfully ground all water pipes. This prevents electrical energy (from lightning or degraded electrical wires) from energizing water pipes. Water Heater Code requires a separate shut-off for the cold water supply at the water heater. This shut off allows water to be turned off to only the water heater, while the rest of the house continues to have cold water service. On the fixture supply to each plumbing fixture (other than bathtubs and showers) in one- and two-family residential homes. On the water supply pipe to each sillcock (outdoor water faucet). 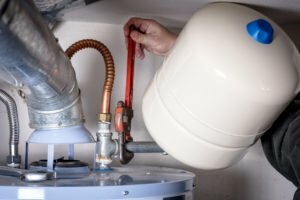 Installing a dedicated water shutoff for water heater that allows water to be turned off water to only the water heater, not the entire home. Individual water supplies shall be constructed and installed in accordance with the applicable state and local laws. Where such laws do not address all of the requirements set forth in NGWA-01, individual water supplies shall comply with NGWA-01 for those requirements not addressed by state and local laws. Shown: Ball-Valve Style Water Shut-Off Valve. Ball-Valves always have a lever handle. Though national water heater code does not specify which type of value be installed, Ball Water Valves may be specified in a local municipality’s plumbing code. WHY? Gate water valves are more prone to failure. Failed gate valves won’t shut off completely, or shut off at all. The details are below. When closing a gate water valve, the shut-off device comes downward as the valve is turned off. It’s common for debris to get in the way, resulting in the valve’s inability to close completely. Because all the parts inside are brass, corrosion occurs over time, and can “freeze” the valve (not allowing the handle to turn). Either of these conditions results in a failed gate valve. Ball valves have a plastic or stainless-steel ball with a hole in the center (where the water flows through). Debris does not have a place to settle like in the bottom of a gate valve. Because the ball is plastic or stainless-steel, corrosion is quite limited. These features make ball valves more long lasting and reliable. Al’s also provides full service plumbing maintenance, repairs and replacements for every plumbing component in your home. Al’s sells and installs Rheem Professional Series gas & electric water heaters, and tankless water heaters. Al’s is near your home in Wylie, Murphy, and Rowlette. We service all homes in southern Denton and Collin Counties with no additional travel charges.